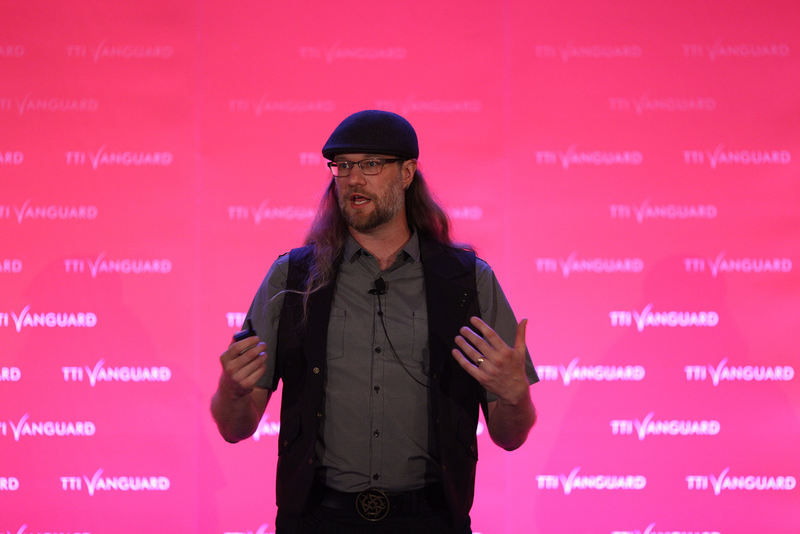 I love to give inspiring presentations that seed new thoughts into the nature of being human by integrating innovative new ideas from the fields of robotics, neuroscience, physiology, and artificial intelligence. Audiences regularly rate my presentations as the most memorable and inspiring of any given conference. I have presented at a wide range of venues around the world and can tailor my presentations to be exciting and accessible to any audiences. Currently I am developing new presentations focused on Innovative Leadership. If you would like a memorable keynote presentation for your event or conference, please contact me. 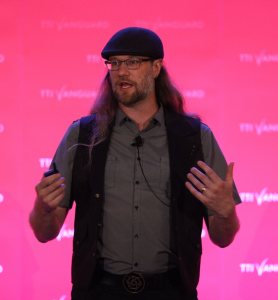 — Steven Cherry, Director TTI/Vanguard The Advanced Technology Conference Series. “This was one of the very best outside presentations that I experienced here.” — Feedback from presenting “Somatic Robotics” and discussing AI and Machine Learning at Neumenta in Sept. 2015. Panel: “Humanity 2.0 in the Age of Exponential and Deep Technologies,” SF, CA. May 10, 2018. Panel & Presentation “The Future of AI in Materials Discovery and Product Design,” at National Materials and Manufacturing 2017 Fall Meeting, The National Academies, Washington D.C., Oct 2nd, 2017. Workshop Organizer: “Workshop on Structurally Adaptive Tensegrity Robots“, The 2017 NASA/ESA Conference on Adaptive Hardware and Systems (AHS 2017), California Institute of Technology in Pasadena, CA, July 25, 2017. “A Deep Dive into Embodied Intelligence”, Invited Presentation, Symbolic Systems Program 30th Anniversary, Stanford University, May 20th, 2017. Creativity, Innovation, and Space Exploration” Invited Guest Presenter on Innovation for the NASA hosted APPEL-Creativity and Innovation Course. August 18th, 2016. Invited: NASA Ames Summer Series, “SUPERball: A Biologically Inspired Robot for Planetary Exploration“. June 14th, 2016. This is currently the most recent overview of my research. Keynote at Robotics and machine learning Silicon Valley Robotics Investor Forum, SF, CA, November 18, 2015. Biorobots: Dissected, Swissnex, SF, CA. October 28, 2015. “SCORES: Structurally COmpliant Robots for Extreme Survivability”, at Fujitsu Laboratories of America 9th Annual Technology Symposium, Santa Clara, June 24, 2015. “Somatic Robots: Neural-Structural Integration”, at Hardly Trying: The Rapid Rise of Soft Robotics Lux Research Strategic Foresight, Innovation Leadership Board, and SRI International, Menlo Park, June 10, 2015. 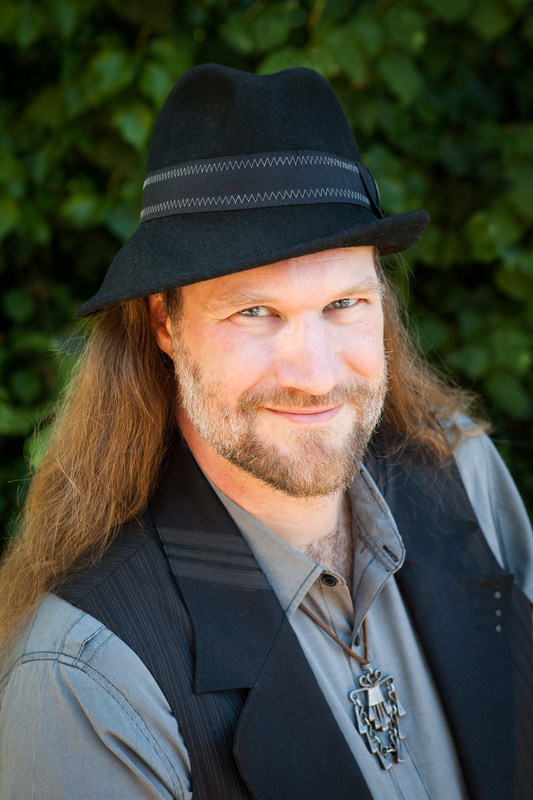 Keynote Presentation “Somatic Robots: Neural-Structural Integration” at CASPA Spring Symposium: “IoT Deep Dive: Moving Beyond The Hype Robotic/Machine Learning & Augmented Reality.”, Santa Clara, CA, March 2015. 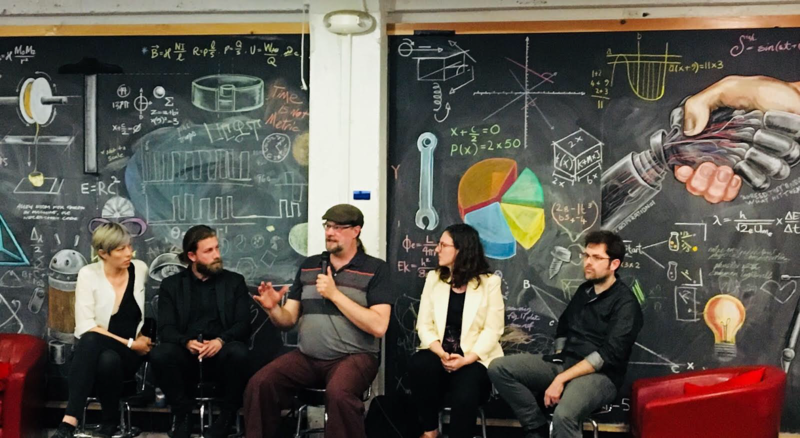 Panelist “Robotics technologies changing the future” at DeveloperWeek Conference, SF, CA, Feb 2015. Super Ball Bot: Structures for Planetary Landing and Exploration, at NASA Innovative Advanced Concepts (NIAC) 2015 Symposium, Florida, Jan 2015. 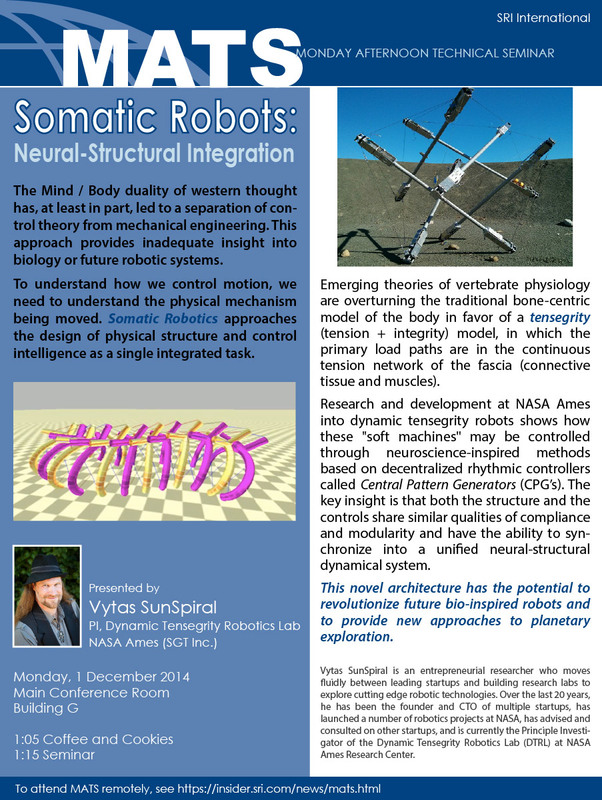 “Somatic Robots: Neural-Structural Integration” at SRI International, Menlo Park, CA, Dec 2014. “SCORES: Structurally COmpliant Robots for Extreme Survivability” Special Invitation to DARPA Maximum Mobility and Manipulation Principle Investigator Conference. Washington DC, Oct 2014. “Intelligence from Rhythm and Motion” Invited Presentation to School of Medicine, Genomics Department, Stanford University, CA, May 2014. “Super Ball Bot – Structures for Planetary Landing and Exploration” Presentation to NASA Innovative Advanced Concepts Program, Stanford University, Feb 2014. “Super Ball Bot – Structures for Planetary Landing and Exploration“, presented at NASA Innovative Advanced Concepts (NIAC) Spring Symposium, Chicago, Il, March 2013. “How We Move: An Exploration of our Minds and Bodies from the Perspective of a NASA Robotics Researcher” Invited presentation at the We Are=Movement Seminar Series, San Francisco, CA, April 2012. “Control Schemes for Complex Coordinated Human Motion” invited presentation at CoLab’s Luna Philosophie, Yahoo Brickhouse, SF, CA, Feb. 2008. “Athletic Walking,” invited presentation to the Carnegie Mellon University Robotics Institute, Pittsburgh, PA, November 2007. “Exploration, Robotics, and the Unknown,” invited keynote presentation given at the 2006 NASA ISGC Research Symposium, University of Idaho, Moscow, Idaho, October 2006. “A Proposal for the Creation of a Diagnostics and Power Port Standard,” presented at the AIAA Space Automation & Robotics Symposium, Naval Research Laboratory, Washington, DC. March 2005. “Building Hybrid Rover Models: Lessons Learned,” invited presentation for the Robot Fault Diagnosis Workshop, International Conference of Robotics and Automation, New Orleans, Louisiana April 2004.